For those of you who are among these curious for the hours, I prepared a spreadsheet that notes the hours when the New York Stock Exchange and NASDAQ index are open in the United States (the hours are Monday through Friday, 9:30 a.m. EST to 4:00 p.m. EST). This is when the stock market is most liquid, and any order you enter is (usually digitally) matched with a buyer/seller on the end. If you are trying to purchase stock outside of these hours, you can use a pre-market or after hours trading option in which a brokerage house works with the Depository Trust & Clearing Corporation in order to process the sale. In the United States, the NYSE pre-market hours begin at 8:00 a.m. EST until the open of the market at 9:30 a.m., and the after hours trading begins when the market closes at 4:00 p.m. EST and runs until 8:00 p.m., Monday through Friday. The NASDAQ exchange follows the same hours. Through some brokerage houses, there is a pre-market trading session for the New York Stock Exchange and NASDAQ that begins at 4:00 a.m., but in order to access this pre-market option, you must have an account with a “direct access” broker that trades limited inventory via the Depository Trust & Clearing Corporation. In these instances, someone who wants to buy or sell shares of a NYSE-listed stock, at, say, 6:00 a.m. EST on Monday, and has a brokerage account somewhere like Interactive Brokers, can enter into a pre-market transaction with another account-holder at Interactive Brokers that is also trying to buy/sell the stock during the same pre-market trading session, and then Interactive Brokers coordinates with the Depository Trust to route the transaction during ordinary market hours. 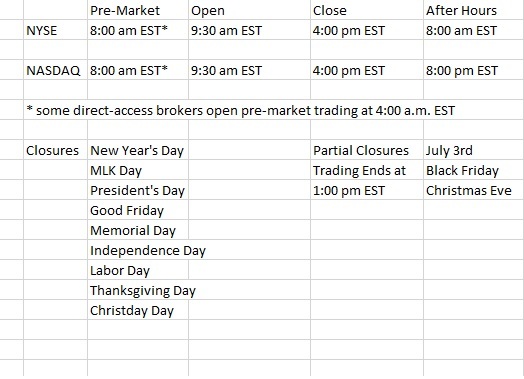 The stock market is closed on nine holidays, which are: New Year’s, Martin Luther King Day, President’s Day, Good Friday, Memorial Day, Independence Day, Labor Day, Thanksgiving, and Christmas. The market has partially closed hours on the day before the 4th of July, Black Friday, and Christmas Eve. Sometimes, in honor of a special event such as the death of former President George H.W. Bush, there is also a trading closure. In short, the stock market opens at 9:00 a.m. EST, closes at 4:30 p.m. EST (on the NYSE and NASDAQ exchanges), and depending upon your brokerage house, you should at least be able to pre-market trade by 8:00 a.m. EST and trade in the after market hours until 6:30 p.m. EST. ← Only Fools Believe In Buy And Hold, The World Is Ending, Etc.